How can I know if a Lladro porcelain figurine is antique? How I can distinguish between old and modern porcelain figurines of Lladro? In order to know the right antiquity of Lladro porcelain figurines, the first thing to check is the type of seal that bears on the bottom of the porcelain. When we proceed to verify the mark printed or engraved on the bottom, the label must be identical to those set out below in the chart. These seals are also available at the official website of Lladro or sending me a request from our website www.cocowif.com, or mail or via facebook (Alejandro Cocowif). The company Lladro make the differece in the Antique of its porcelain figurines through the form, the type of the seal taxed in the figurine. As you can see in the early days of Lladro, in all the figurines of the pre-production list, the seals were taxed, then went on to be printed. If you realize one of the seals (the second), it is a brand with vertical and horizontal lines. Oddly enough this is also a real hallmark of the early years of Lladro. 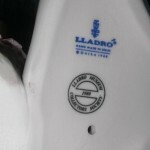 How to check the veracity of the seals of Lladro? What is very important and the first thing you must check is that the drawing of the logo, ie the flower-shaped part, is full. Otherwise, if you see that is only half the flower or it is deleted or crossed out, the figurine is a defective porcelain from the factory, by the main reason not having passed the minimum standards required by the company Lladro. The absence of the logo does not implu that it is a real piece of Lladro; do not be ripped off, the only thing is that the real value of these pieces is much lower for the reason of being a flawed figure. It is very typical in store in Madrid calle viriato, 38; to receive honeymooners interested in selling porcelain figurines that they just have received as a wedding gift. This people hope my assessment is high, in order to get a large sum of money, but nothing at all, when we turn around the figurine of porcelain and we check the type of seal that usually have …. We realize the kind of gift they have received. And the faces and expressions of the newlyweds .. (but if my aunt gave it to me as an incredible gift, she loves me a lot!!! she always gives me good things ….). In the wedding gifts you can check many weird things …. How to know the value of my Lladro porcelain figurines? If you want to know the approximate assessment of your porcelain figurines, you can contact with COCOWIF and send us the reference (if you know) or a picture to advise you, free of charge; You can also consult in the same company Lladro, via internet (www.lladro.com) or by going to any official store of your location. Do not get into mistake, for the purposes of economic valuation, Nao with Lladro. Nao value is lower. Both brands belong to the same group, but different departments. Nao quality is also superb, but the Lladro brand is much more valued.